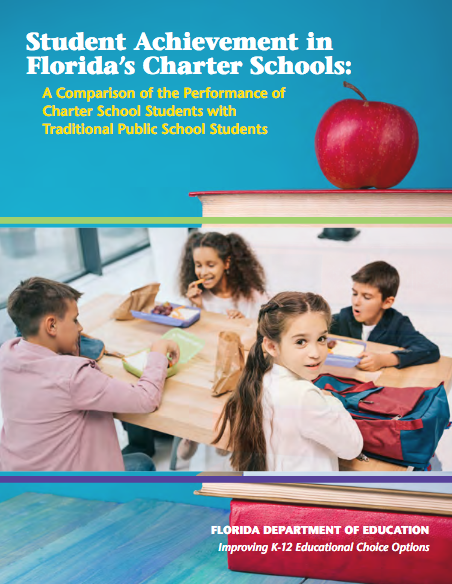 · In 63 of the 77 (82%) comparisons, students enrolled in charter schools demonstrated higher rates of grade level performance than their peers in traditional public school. · The report concluded that the achievement gap was lower for charter school students in 19 of 22 (86%) comparisons. The achievement gap component included English Language Arts, Mathematics, Science and Social Studies. · When comparing learning gains, the percentage of students making learning gains was higher in charter schools in 88 of the 96 (91.7%) comparisons. 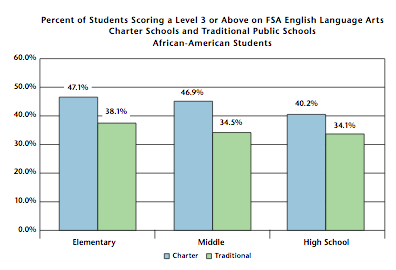 · In comparisons of achievement and learning gains, African-American students in charter schools performed better than African-American students in district-managed schools in 89% of the comparisons. 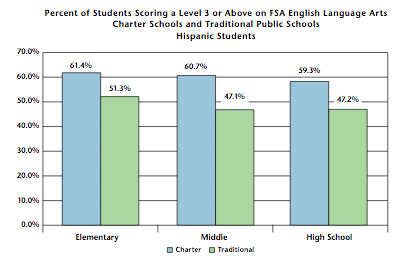 · In comparisons of achievement and learning gains, Hispanic students in charter schools performed better than Hispanic students in district-managed schools in 93% of the comparisons. · In comparisons of achievement and learning gains, students eligible for free/reduced lunch in charter schools performed better than students eligible for free/reduced lunch in district-managed schools in 93% of the comparisons. 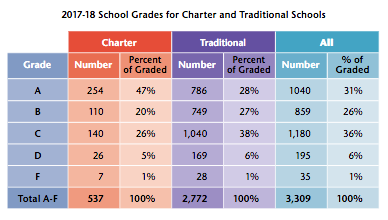 · For 2017-18 school grades, 47% of graded charter schools earned an “A” compared to 28% of graded traditional schools.